CoffeeShop “Amber Lux” Fine Art Texture Set! Today I have a brand new fine art texture/overlay set to share with you! I call this one “Amber Lux” and it adds a beautiful warm texture to your images. I really like using these in Soft Light and Overlays, but try Multiply and Screen for a different effect. You can also desaturate or change the texture’s color. You can download the original images I used in this post: (Dog, Child). And this was the starting texture I used to create the “Amber Lux” set by adding additional textures in different blending modes. The beauty of adding textures is that it can often be just a one or two-step process. For this edit I added the CoffeeShop Amber Lux 2 texture in Overlay blending mode (82%) and then selected the dog, clicked on the texture layer, and Gaussian- blurred out the selection. This allows me to add the texture color to the dog without adding the texture. This tutorial will help if you are new to this process. This edit was slightly more complex. I wanted to add contrast to this image so I duplicated the background and put it in Soft Light. Then I added a Levels adjustment layer in Multiply to darken it. Then I added the CoffeeShop Amber Lux 1 (desaturated) twice in Soft Light blending mode (100% and 45%) and finally added a Hue/Saturation layer on top and slightly reduced the red saturation. 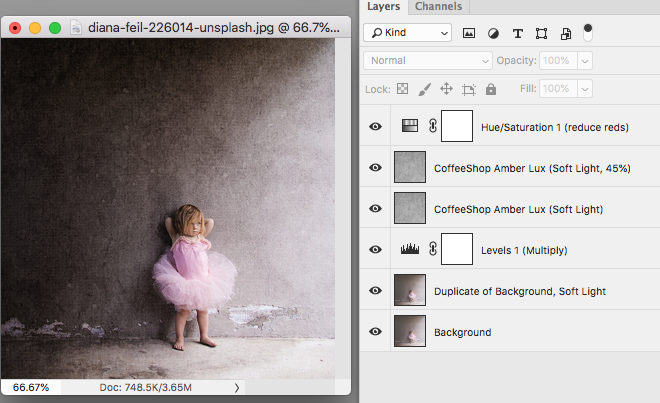 I also selected the little girl and blurred out that selection in both texture layers as I did in the dog edit above. I hope you enjoy playing with these new tutorials! I would love to see your edits using them on my Facebook page. Download the CoffeeShop “Amber Lux” Fine Art Texture Set.